Children and Puppies.....Puppies obviously grow at a faster rate than children. Just Seem To Go Together. It's just good practice to keep a watchful eye on young children and puppies. Dogs are pack animals, which means they live in groups and they have a very strict social order. Its very important that they learn their place within your families "pack". Puppies are so small and usually so adorable we simple overlook the fact that as they grow they will test this order so they can move up in the pack, this is very natural. For the safety of everyone, and as much as we love them, the family needs to be higher in the pack order than the dog. Keep in mind "pack" leaders defend the pack and make the rules. Once a dog knows he has a strong pack leader (you) and feels his position is secure accepts the rules and lives happily. Puppies obviously grow at a faster rate than children, so children have a harder time establishing and holding their position as part of the family "pack". The puppy as it grows is sometimes eye to eye with the child and this can be scary for both of them. The dog may feel he has the right to discipline the child when that child tries to take their food, or a toy, or if the child plays to rough with them. That is why training children and puppies (soon to be dog), is so very important, this ensures the safety and happiness of both, Children, and Dogs. Children will learn to respect living things and to take part in the responsibility, with your guidance. They should learn, like humans, puppy's also have needs. Children should be taught to take an active part, sharing the responsibility of the exercise, feeding, cleaning and care, with close supervision. Grooming is also a good way to create bonds between children and puppies. A word of caution to all families with small children. 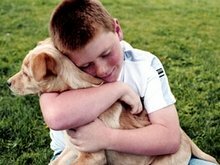 Children are known to "love a puppy to death" squeezing or hugging the animal could be irritating or even painful. Some children will tease and taunt the puppy while is resting or eating, teach them how to gently stroke and handle the puppy, parental supervision and guidance is a must. Behavior patterns are set early on, your puppy will be learning how to respect and trust you and family members. Provide them with proper care, a fair share of attention and your children and dogs (or dog) will be wonderful companions for many years to come. 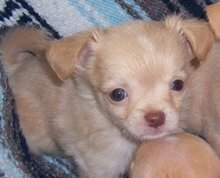 Bringing a new puppy to the family and home can be wonderful. Allow children and puppies to get used to each other from across the room or yard. If you are introducing a new puppy with an already established pet or pets, you may want to do it gradually and give the new pup a chance to get to know the established pet to help avoid any rough confrontations. Sometimes older established pets can be territorial and it is natural for them to defend their family and home, so take it slow. If a fight does breaks out, separate them immediately, then slowly bring them back. Warn younger children to not get in the middle of a dog fight.